A strong seafood focus: Lotus, Barangaroo. Sydney’s hottest new eat street is fast revealing itself to be along the Wulgul Walk at Barangaroo. From the brains behind Bentley, Monopole and Yellow comes Cirrus, a place that celebrates good wines and sustainable seafood. Dynamic chef duo Brent Savage and Nick Hildebrand’s latest venture is housed in ‘The Cloud’ building, Noma Australia’s former location, with views across the north end of Darling Harbour and Goat Island. A unique food and wine lovers’ emporium, Bel & Brio features a fresh food marketplace, boutique wine store, eatery, bar and restaurant across an impressive 800 square metres. Fresh vegetables and eggs are sourced from their own farm on the Central Coast. Modern Chinese flavours combined with native ingredients are the emphasis of the seafood-focussed menu at this dumpling house headed by Billy Kwong chefs Chris Yan and Kenji Okuda. Formerly a pop-up of note, Belles has found a permanent home in Sydney on the Wulugul Walk. Fried chicken is served with a range of old-fashioned sides such as mac ‘n’ cheese, ‘slaw and fries. All to be enjoyed with a glass of organic wine. This bustling Vietnamese street-food restaurant and tapas bar serves up hometown favourites including pho, salt and pepper quail and deep fried fish with chilli relish. Translating to ‘Little Glutton’, this Surry Hills favourite is bringing popular Thai street-food to the waterfront along Wulugul Walk. Chef Kirby Craig adds a unique Japanese twist to the humble burger, elevating Ume Burger to celebrity status. Order the Ume Bacon Cheeseburger with cheese, rice vinegar pickles, lettuce and Ume’s special sauce to get the tastebuds tingling. Drop into Sydney’s first bar and bistro dedicated to vermouth, with over 40 varieties to enjoy straight, mixed or martini style. This latest venture from chef Hamish Ingham and Rebecca Lines, the duo behind Surry Hills’ successful Bar H, features a Mediterranean, focussed menu incorporating botanical elements. 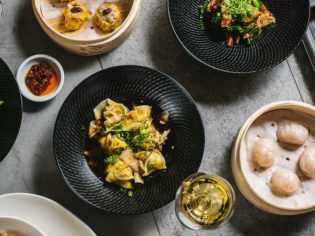 Darlinghurst/Surry Hills favourite Zushi will be popular with sushi lovers, serving bento lunch boxes and contemporary share plates for dinner. Lovers of Spanish wine, sherry and tapas will be drawn to this bustling wine bar which will have a similar vibe to the original Tapavino in Bulletin Place. One of Sydney’s hidden secrets, love.fish will focus on sustainably sourced seafood and biodynamic wines. Sip on a selection of all-Australian cocktails featuring only native ingredients such a lemon myrtle, wattleseed and Australian desert lime. We’re fans of anything Somer Sivrioglu of Efendy puts his hand to and Anason, with its modern Turkish fare and cool blue hues, is no exception. Wait, there’s more: Matt Moran will be fronting a three-level restaurant extravaganza in the spring of 2017, which gives you plenty of time to work your way through the above first.